Learn about the temperament and personality of the Shih Tzu. Discover what he's like to live with, his traits and characteristics and how he generally behaves. And look at lots of Shih Tzu photos. The Shih Tzu is a dignified, lively, alert, happy, sweet and playful. He craves your companionship and just wants to be with you. He's very affectionate and loves to cuddle and kiss and sit on your lap. He may be sweet, but he knows how to stand up for himself if confronted. He's friendly and sociable with strangers. He doesn't need much exercise and will get most of it just running around inside. He's one of the most popular dogs in the United States. The Shih Tzu is the hardest to train of all dog breeds. He learns new commands slower than all other breeds. You will need to be extra patient when Training him. 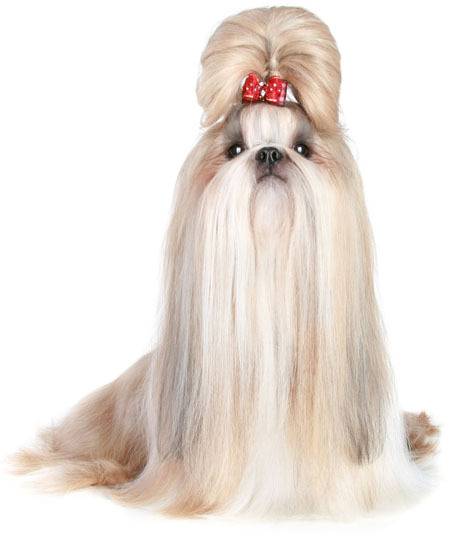 The Shih Tzu sheds practically no hair at all. You'll virtually never find a hair in your home! Pet coat (less work): Cut his coat short every few months and then it only needs to be brushed every so often. Show coat (more work): Professionally groom his coat to the breed standard. Brush it daily.